Walking Backwards, by Lee Sharkey. North Adams, Massachusetts: Tupelo Press, October 2016. 89 pages. $16.95, paper. 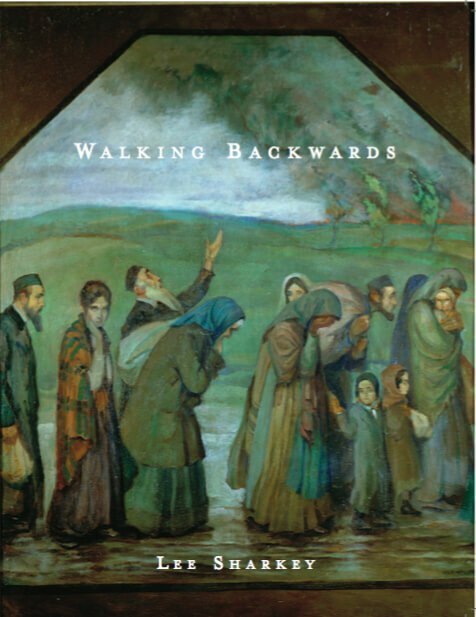 On the cover of Lee Sharkey’s Walking Backwards, an anonymous oil painting—“Pogroms”, circa 1915. A long line of people crosses from left to right—their clothes the same color of the background, as if the landscape had already started absorbing them, soon to entirely obliterate them. Two of the men look vacuously forward—not far, as their gaze is stopped by the nape of the person walking in front of them. Head protruding as if the neck couldn’t hold it, one of them crushed under the weight of the bundle he carries. An old man gestures towards the sky, perhaps in prayer. But the sky is full of smoke—behind sparse trees a village is burning. Three women, scarves knotted below their chins, bury their face deep into their hands, as they blindly proceed—we don’t see them, they refuse to see. Two young women, a small child, a baby, stare out of the painting right into the viewer’s eyes. Neither they face their destination, nor look back at whatever they have left. They look out as if asking for witnessing, as if to verify if someone notices, understands, will tell, will remember. Cautionary tales, in folk tradition, were warnings against dangers, threats, hazards listeners should learn how to avoid. “Cautionaries” is a poem in eight sections, warning us not sure about what. Like a spread of tarots cards, each number describes a different scene, but they work together. Images are precise, vivid yet wild—they have the haunting fragmentation of dreams and their ambiguity. One word suddenly introduces doubt, shattering the surface linearity of the narrative. Why does the son with the flapping t-shirt “rest”? Is he dead? What is “shame” about? Were the hands “exiled”? Weren’t they cut, instead, because they had caused the body to sin? If yes, what had they done? Was Tycho Brahe unburied? If yes, why? Number eight mentions a sound that “has lost its mother”, and a “country of limestone and fir”. By association, a well-known philosophical quiz comes to mind. If a tree falls in a forest and no one hears it, does it make a sound? Does an evil, does a tragedy that no one witnesses occur? “Gleaners”, the second poem of part one, has also eight facets, linked to each other like beads of a prayer bracelet. Here we slide further back in time, as the title of the collection has promised. Tone and prosody are chanting, litany-like, Biblical imagery pronounced. Jacob is evoked in his nocturnal struggle, and a shiny tree—perhaps Moses’ rosebush on fire. A harsh god flashes by as a hypothesis of punishment. The exodus of the Hebrew people from Egypt seems to be the backdrop on which loss, exile, deracination infinitely repeat themselves. It’s a tale of endurance, poverty, land and fruit subtracted or perishing, resignation and patience, treasuring and sharing what’s left. Walking backwards is also walking in circles, the author says in part four. Therefore I’ll skirt the center. I will spiral in at a later time. In part four, the title of the collection unfolds. The first poem suggests that two brothers might have summoned someone to “return”—with a letter they drafted over and over, in Paris, where in 1947 they found themselves alone. All the rest of the family had safely escaped in America. It is safety then that must be renounced in order to answer their call. But can safety be left behind? Of course not: the voyager has to walk backwards. Cautiously, yet still endangered, her heels trapped in her trousers as she bends her knees, slipping over worn cobblestone as her retrograde motion leads her to the capital of a small country, with streets pavements reminding those of Prague or Budapest. It is Vilnius, Lithuania—the notes explain. We would not know and maybe don’t have to, as again the backdrop supports overlapped transparencies. She has blinded herself, the traveler, hiding her head in her pocket—for reason not to impede her folly, perhaps. Of course walking backwards, as doing anything in reverse, has a powerful ritual meaning, in the same tradition were cautionary tales thrived. During the European Middle Age it occurred on specific dates—Carnival among them—and it granted access to otherworldly domains. The invisible. The dead. Where are they? Those escaped from the Ghetto of Vilnius? Those who hid in the woods and lived on wild berries, smearing black paste on infants’ lips for the sake of silence? If a tree falls in a forest and no one hears it, does it make a sound? Walking backward leads to what remains of the Ghetto—to a place of vanishing, still preserving echoes. Sparse pages of a diary, a roofless synagogue, traces of gold where the ark once was, a patch of blue painted on crumbling plaster. Part five elaborates on the theme of persecution, as it focuses against artists and poets, aiming at destroying a culture’s distinctive voice. Two historical moments are excavated and witnessed. One is Hitler’s attack against “degenerate art”, together with the Nazi looting of Jewish private collections in Vienna. The other is the execution of Yiddish-language poets and intellectuals—Peretz Markish among them—under Stalin. The first poem of this section describes “degenerate” paintings about to be auto-da-fes, in a blasting vividness of hues, forecasting a doom of impending colorlessness—the advent of a black-and-white phase of European history, a smoked out, burnt landscape. Part six begins, indeed, with a black-and-white vision. In “Verge”, the author has “picked up time and tossed into the river”. Magic gesture—like in nursery rhymes, like into a kaleidoscope, everything starts metamorphosing. Time becomes duck, becomes fish, boatman, water, curtain. Something devours something, something is executed. Something disappears in a flash. There is no time to see—because time has been tossed into the river. Following poems quote lines by Yiddish-language authors mentioned in the previous section, weaving them through the text, “in conversation”—as if gleaning what’s left after massacre, salvaging precious voice from erasure, mending the damage done. Voices were suffocated by force, lost in oblivion—also swallowed in, because of the impossibility of rendering too much horror: “You flinched when I told you they poisoned the loaves.” “I’m sorry to have used my mouth so carelessly.” And yet language only, today, can redeem us—says the last poem, “Something we might give”. The walk backward—both “longer than legend”, and a “short walk to ourselves”—leads to the place where the dead have waited for us. We are late, our absence an unforgivable fault. Still we can bridge the gap, stepping carefully on each protruding stone, gathering each memory no matter how tenuous—“a satchel, a compact, two small gold earrings”. “Scavengers,” like gleaners, “piece the question together”. The town of Jerusalem inhabits the second and third part of the book, filled with biblical references intertwined with snapshots of the present (soldiers, checkpoints). The main theme is enmity between brothers, kin sacrificing kin for causes that might find justification—but is there one? The image of split-off hands, first appeared in “Cautionaries”, returns. Does it signify denial, a refusal of assuming responsibility? Abraham’s hands, when he sets to kill his son at God’s demand, diverge—the left one doesn’t know what the right one does. “Equations,” the last poem of the series, recalls a preexistent pact of harmony, reaffirms similarity and a shared root for those fighting over a place to be called home: “My former rain is your latter rain.” “My white cloth by candlelight is your white cloth by candlelight”. “Intention”, a ten-fold poem in part three, invokes similarity of languages, juxtaposing Hebrew and Arabic words to prove how they stem from a same seed, as those speaking them do. How can harm be stopped? There seem to be no tongue for peace, at least nothing can be deciphered by the ear. Words need to be re-embodied, to become again “plural, abdominal, breath-borne”. Hand imagery, contraposing knowledge rooted into physical experience to verbal rationalization, helps this purpose. “In the beginning was the hand, and the hands was good”—spells Genesis in reverse. Here’s a dream: a dancer is able to escape the fight and to extend just a fingertip, to establish contact with the unreachable otherness, like Adam did with God. Language fails to carry our peaceful intention if it doesn’t become flesh, doesn’t remember emotion, reconstruct compassion, evoke past communality: “One sanctified history incised the other”. “Our hands hated them not, beforetime”. Toti O’Brien is the Italian Accordionist with the Irish Last Name. She was born in Rome then moved to Los Angeles, where she makes a living as a self-employed artist, performing musician, and professional dancer. Her work has most recently appeared in Trampset, Typehouse Magazine, Crux Magazine, and Indiana Voice.